Size of Male: 17 lbs., 14.5 in. Size of Female: 17 lbs., 14.5 in. 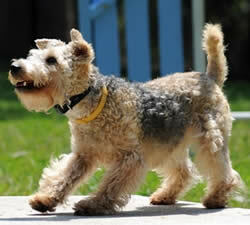 The lively Lakeland Terrier is one of the oldest terrier breeds in continuous existence, dating back to the 1800s. These cheerful, confident dogs were used to kill foxes who made forays onto farms. Lakelands are adaptable and can easily live in either the country or the city. They are friendly dogs and love children. They make excellent family pets. The Lakeland Terrier is likely a descendant of the old Black and Tan Terrier of England (extinct now), as well as the Welsh Terrier, the Wire Fox Terrier, the Border Terrier, the Bedlington Terrier and early Dandie Dinmont Terriers. Lakeland Terriers were developed in the area around Cumberland County in England. They were used to protect farmers’ sheep from foxes and other vermin. Unlike some terriers who simply had to bolt foxes, the Lakeland was used to find and kill the foxes. Their bodies are made narrow so they could dig down into a fox’s hole and slip inside easily. Their wire coats protect them from brush and bramble in pursuit of the fox and other vermin. Today, most of these dogs are family pets or show dogs but some still do their original work on farms, or participate in earth dog competitions where they can show their skills. The Lakeland Terrier is a bold, cheerful and happy dog. These are friendly dogs and they usually have a quiet disposition. They love children and they usually get along well with other pets, especially if they are raised with them from a young age, including cats. However, it does help to socialize a Lakeland with small pets in the household to make sure they won’t try to chase them. The Lakeland can be a good watchdog, barking when necessary, but they are usually accepting of strangers once they are introduced. They can become overly fond of barking at times and you may need to teach them to stop barking. These dogs love to dig so be sure that your yard is escape-proof. Check your fences regularly. The Lakeland is an active dog so it’s best if you provide him with plenty of exercise and activities. They can be hard to house train but are usually otherwise easily trained. Living Environment – The Lakeland Terrier is a relatively small dog and they adapt well to living in an apartment. They are active indoors but if you provide them with plenty of exercise they should be happy. They are also very happy living in the country with a fenced yard of their own. They can be prone to chase small animals, so make sure that they are in a safe area if you allow them to exercise off-leash. Grooming – Lakelands have a harsh, wiry coat which sheds minimally. For show presentation it should be “rolled,” or stray hairs should be plucked continually to keep it looking trim. However, most pet owners will opt for a style that requires less work. Talk to a pet groomer about care for your Lakeland’s coat. They will need to be stripped or clipped several times per year. Use a shampoo for wire coats for these dogs so the coat won’t be limp and soft. Brush regularly. Diet & Exercise – The Lakeland has normal dietary needs and they do require regular daily exercise. They are small dogs but very active and have relatively high energy demands for their size. They need a good daily walk or, preferably, a good run and play time. They appreciate having their own fenced yard when possible. Health – In the health department, the Lakeland is considered a generally healthy breed. There are a few health issues that have surfaced occasionally but none seem to have become widespread in the breed, according to the breed parent club. If you are interested in this dog breed, you should talk to a breeder about possible dog health problems. The Lakeland Terrier is said to be hard to house train at times but dog training is otherwise not difficult. They are intelligent dogs and they enjoy pleasing their owners. As terriers they may be independent and stubborn at times but Lakelands can do well in a variety of dog activities with proper training. Use positive dog training methods (praise, rewards) and you shouldn’t have any problems.